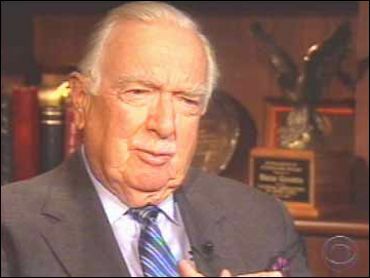 Walter Cronkite, who covered the war in Vietnam from overseas and the CBS News anchor chair, described April 29, 1975, as "a mad dash out the door into the parking lot for the waiting helicopter. And then it was farewell to Vietnam." On the anniversary of the final U.S. withdrawl, Cronkite reflected on the lessons of America's longest and most wrenching war. I think we have to appreciate that to a certain degree, as dramatic as the fall of Saigon was and as uncomfortable as we were with our last evacuation from Saigon, it did finally put a period to a terrible time in American life. We were recovering from the trauma of the assassination of a president, and of leaders in the civil rights fight: Martin Luther King, particularly. We were beginning to reestablish something that we recognized as the America that we thought our country was. During the 60s, we lost track of that completely. I think there is no doubt there was a reassessment among the American people at the time that we finally left Saigon. We knew we had lost in Vietnam before we saw that final day. And we were clearly not omnipotent. It taught the military a very important lesson that I think it has begun to forget in some ways. But for a period of 25 years, nearly, the military believed that it had to have public approval before it committed forces overseas-that it could not fight an unpopular war. We shouldn't be arrogant about our power and the use of our power. We should understand that there are attitudes, political positions being taken abroad, that are deeply seated in the culture of the countries involved, and that we should be very careful believing that what we think is right in America is necessarily right for the rest of the world. We should be very cautious. We should be sure that we understand what we're getting into when we dabble in the affairs of other nations. And that is particularly true when dabbling gets to the point of committing military forces.